Our recent post about the old gravel pit and landfill at NE 33rd and Fremont produced some interesting mail and conversation that helps complete the picture of the house that once stood at the southwest corner of that intersection. First, a photo from frequent AH source and long-time neighborhood resident John Hamnett showing the house. John and his father were out in the neighborhood with a camera on the sunny day following the great Columbus Day Storm of Friday, October 12, 1962 documenting damage and downed trees. John remembers they came upon this toppled fence and wall on the south side of the house. The blue and white enclosure surrounded the swimming pool. The Oregon Encyclopedia entry about the storm reports wind speeds were clocked as high as 170 mph. 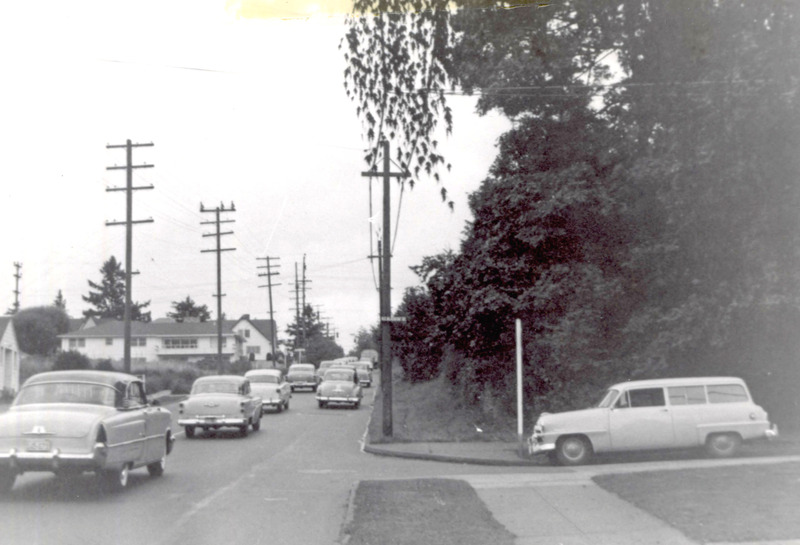 Looking north at the southwest corner of NE 33rd and Fremont, October 13, 1962. Photo courtesy of John Hamnett. Next, we re-discovered this 1954 photo looking north up the hill toward Fremont from the corner with Klickitat. 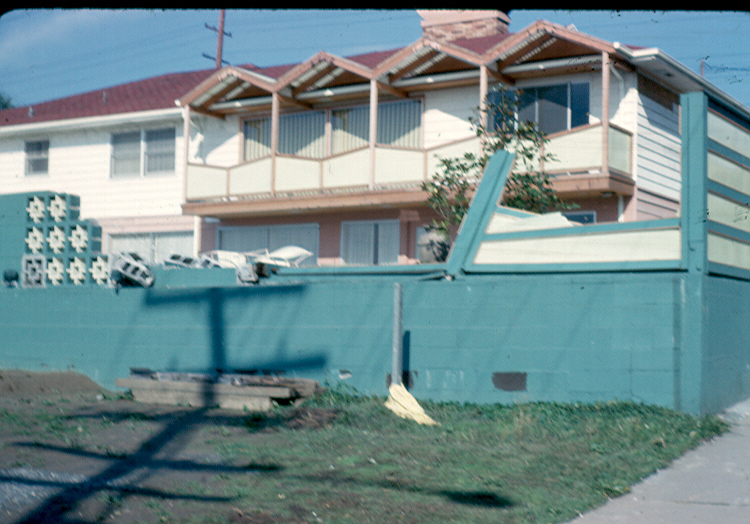 When you click into this image, you can see both the mid-century modern house that was eventually removed from the site, and the house behind it, which still stands. Looks like a vacant lot just downslope. Photo Courtesy of City of Portland Archives, image A2005-001.955. Click to enlarge. And last, this helpful comment from Judy Wathen, who used to own the house, and remembers it from its heyday of the 1950s. My husband and I were the ones who bought the house with the swimming pool on the corner of 33rd and Fremont in the ’90’s. Before we bought it we had two different geological engineering firms test the soil and evaluate it’s stability. Both said that it was stable and leveling the house could easily be done. Both were wrong. The cost to stabilize the house was beyond our resources. Fortunately, a grade school classmate, Terry Emmert, offered to buy the house and move it to become the first remolded home on the Street of Dreams. We sold the lot with all the engineering studies to a builder who hopefully did what was required to stabilize the land before he build what is there today. A little bit more history about the house. I grew up in Laurelhurst in the 50’s-60’s. Our family drove by that house regularly on the way to Riverside Country Club, where we were members. My father told us about the house. My father’s friend, who owned the well known Fox Furniture Co., built the house with the swimming pool as a wedding gift to his daughter and her husband and that it was built and finished to the highest quality. That certainly was true, except for understanding the engineering of the foundation. Over the years, we’ve heard the notion that there was once a gravel pit and then a garbage dump at the corner of NE 33rd and Fremont. We remember in the 1990s when the house at the southwest corner—the one with the old swimming pool out back—was removed because of major foundation problems, which seems like reasonable evidence of the underlying problem. But we wanted to know more, so we tracked down the details. Let’s start with a photo to put you in context. Here is the area in a 1925 aerial photo, the earliest one we know of. There’s lots to look at here, but start at the large vacant lot in the lower right hand corner. The street running east-west is Fremont and the vacant lot just below it to the south is actually three blocks, between today’s NE 32nd Avenue on the left and “E 33rd” on the right. 32nd Place (then known as Glenn Avenue before the Great Renumbering) does not yet go through. 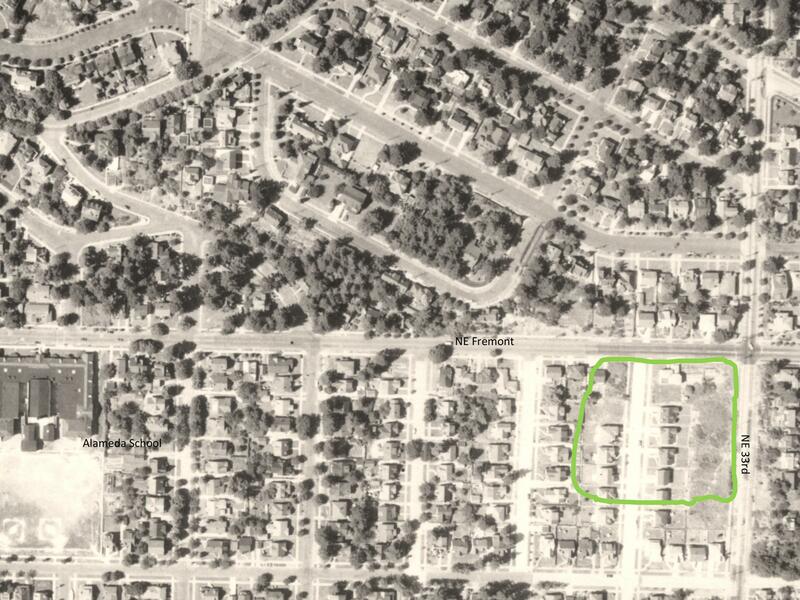 Detail from a 1925 aerial photo showing the intersection of Fremont and 33rd, two labels added for reference. Click to enlarge. Aerial photo courtesy of City of Portland Archives. That’s a pretty steep slope to the south (just ask local kids with sleds hoping for snowfall) which is one reason it’s one of the few unbuilt pieces of ground you can see in this photo. Back in the late 1890s and up until about 1910, that slope was heavily excavated for gravel, which makes sense. It’s right along the crest of the Alameda Ridge, which after all is one giant gravel deposit left over from the cataclysmic Lake Missoula Floods of 13,000-15,000 years ago. The Fremont gravel pit provided tons of rock for a young and growing Portland, which was busy building roads. 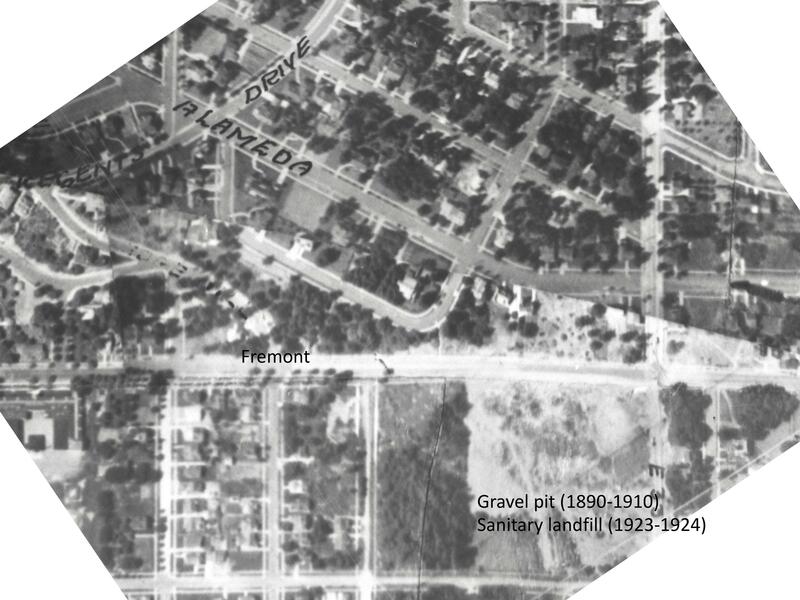 In those early years, 33rd and Fremont even became known as Gravelly Hill, a name that stuck around for decades (we try to slip that name into a conversation whenever we can, you should try it just to keep it alive). In the photo, you can see the disturbed area at the top of the slope all along the southern edge of Fremont. That was the top of the gravel pit. A few years later it was also the top of the garbage dump. In 1910, Benjamin Lombard, who developed the Olmsted Park plat which you can see just up the hill in this photo (now considered part of the Alameda neighborhood), sued the city for violating its own ordinance that prohibited gravel pits within 100 feet of a public street. Fremont was a city-owned street, plus the city owned a good chunk (but not all) of that vacant lot to the south too. East 33rd had long been known simply as the County Road and was the county’s responsibility. A letter to county commissioners in August 1910 reported “the roadway at Thirty-third and Fremont streets is in danger of caving in because of excavation in the Fremont gravel pit.” The county passed this complaint along to the city, which was also hearing from Lombard about the same time. Due to the undercutting of the slope required by the gravel mining operations, Fremont Street was just about ready to slide down the hill. 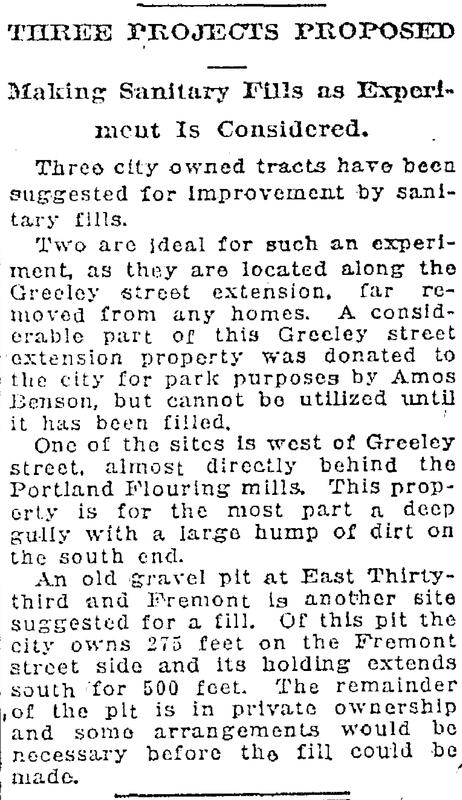 This 1910 kerfuffle ended the slope’s official function as a gravel pit, though other places—notably a nearby hollow on privately owned land at the corner of today’s NE 37th and Klickitat—stepped in to meet the gravel need. Fast forward to the early 1920s. Portland was booming and rapidly running into a garbage disposal problem. The city’s Guilds Lake Incinerator, located in Northwest Portland at NW 25th and Nicolai, was operating at full capacity and the city needed to find another way to deal with garbage. William G. Helber, Portland’s Superintendent of Garbage Disposal, had visited Seattle and seen a new technique called “sanitary fill,” whereby garbage was mixed with dirt and buried in layers on uneven ground. This had the double “benefit” of disposing of garbage and leveling off land that could then be used or sold for other uses. When Helber looked out across the Portland landscape, he fixed on several locations he believed would function well as sanitary fills. Because the city didn’t own the downslope part of the hill, it took some creative deal making with the adjacent private owner to make it all work. Downslope owners Joe and Frances Brooks also owned the gravel pit at 37th and Klickitat. They agreed to let the city use the lower end of the Fremont pit for the garbage fill as long as the city would also fill up their old gravel pit on Klickitat with garbage. This site became known as the “Beaumont Fill.” The Brooks were then free to sell that as viable real estate to the developer who wanted to build houses there. Not everyone was happy with the idea of burying garbage so close to existing homes. Alameda neighbors, who were always ready to protest (schools, camps, churches), were particularly skeptical. But Helber took them out on the ground to have a look at what he had in mind and the neighbors seemed satisfied to give it a try. 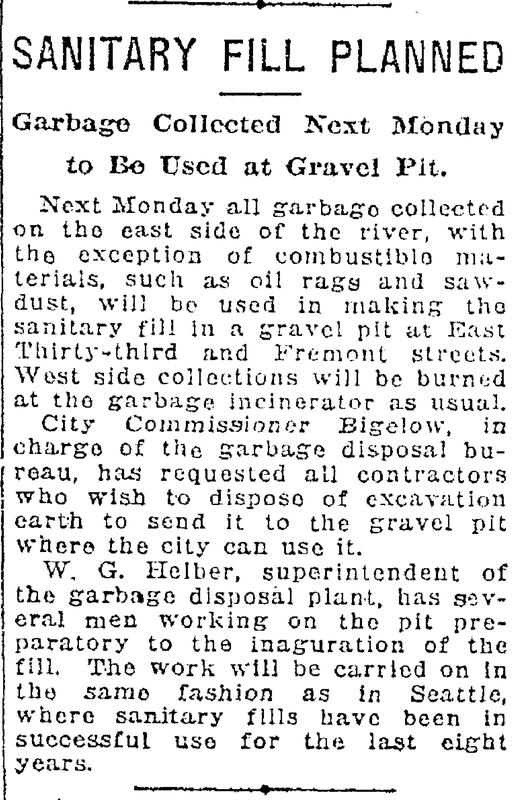 Starting in February 1923 through June 1924, all non-commercial trash from Portland’s eastside was hauled to Alameda to fill up the old Fremont gravel pit. When the summer of 1923 rolled around, everyone held their breath (and their noses) wondering if the heat and the garbage would create a smelly problem. No news must have been good news, because there was no further coverage. Here’s a great photo from the early 1930s that shows both of the completed sanitary fills (and so much else to look at). We love this photo. 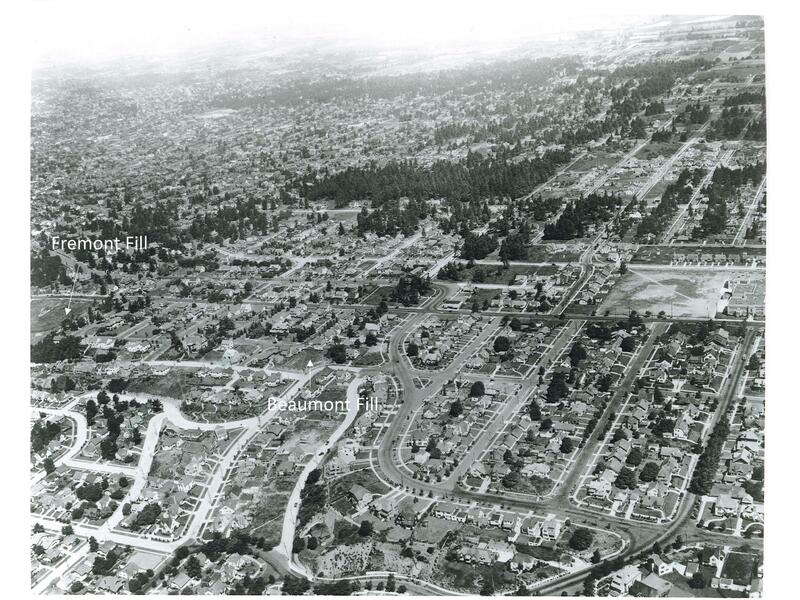 Aerial oblique photo from the early 1930s shows both former fill sites and a lot more, including a very brushy Wilshire Park and the new Beaumont School. Click to enlarge this amazing photo. 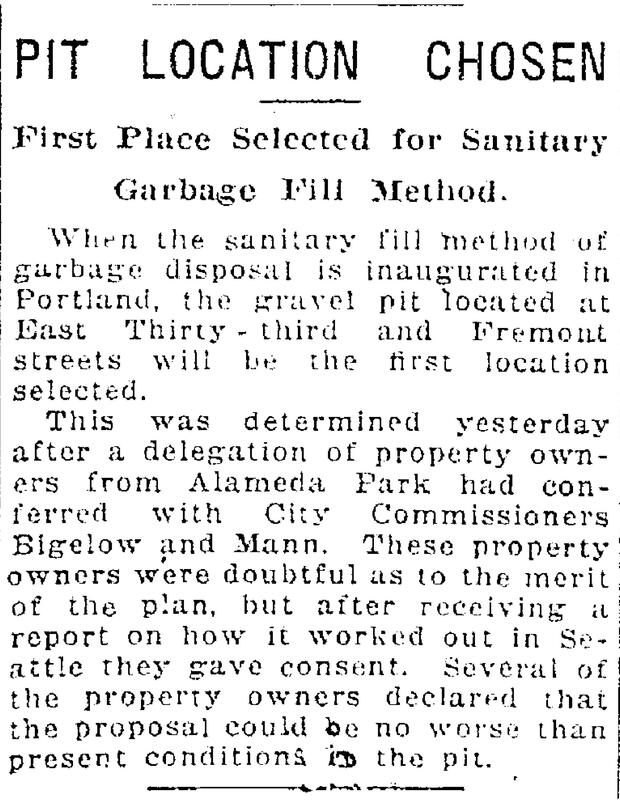 In 1924, one year after opening when it became time to shut down the Fremont Sanitary Fill, the city realized it had trained all of east Portland to bring its trash to Alameda, and that it would probably take some retraining and even some enforcement to break the habit. That’s a lot of garbage. Sixty-two loads arriving at the top of the hill on Fremont Street each day for more than a year, dumped over the edge, spread by tractor down the slope and covered over with a little dirt. The city continued to use the sanitary fill method in other areas as it planned a larger incinerator—a long drawn out process because no neighborhood wanted it in their backyard—which was ultimately built in 1932 in St. Johns and is known today as Chimney Park. But in the meantime while incinerator planning and location were being fought about in City Hall, the fill method was gaining critics. Here’s news of neighbors at NE 37th and Alberta (today’s Alberta Court) complaining about the stench to City Council. Back at the Fremont fill in the early 1940s, home construction was just getting underway. Here’s a photo from 1943. Detail from a 1943 aerial photo, green outline added to show former gravel pit and fill area.